Cheshire Academy's Alexis Holmes had the greatest weekend of any Connecticut sprinter at the New Balance Outdoor Nationals in Greensboro, NC. The senior has committed to run for Penn State, following other Nutmeg track stars such as Cas Loxsom and Danae Rivers. Sunday began with her running the 3rd fastest time in the preliminaries of the 200m to qualify for the finals with a time of 23.46. Holmes came back 90 minutes later to set the meet record and U.S. No. 7 all-time in the 400m with a time of 51.21. Then with another two hour break, she came back to finish 7th in the finals of the 200m with a 25.25. To put her performances in perspective, she crushed the all time Connecticut records of 23.75 in the 200m and 52.67 in the 400m. But, unfortunately, all state records performances must be made by an athlete affiliated with a CIAC school which Cheshire Academy is not. So those records will remain in the books for some future athlete to break. Juniors Chet Ellis of Staples and Justin Forde of Brien McMahon continued their rivalry in the high jump down in North Carolina. While Forde is still our state leader, clearing 7'0 at the Middletown Inviational, Ellis has bested him at FCIACs, Class LL and the State Open. Well, the Staples Wrecker added another honor to his resume with his 6'10.25 clearance to take 4th place and earn All American. His finish, put Forde's 6'8.25 clearance one place off All American honors in 7th place. 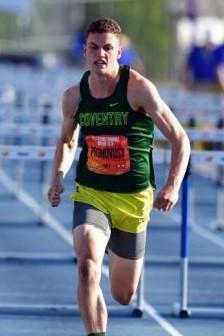 Over Saturday and Sunday, Coventry's Nicholas Pronovost completed the grueling 10 event decathlon. His score of 6,435 was the 3rd best decathlon score over the past 20 years in Connecticut and over a thousand point improvement from last year's CIAC decathlon. The best part is the All New England hurdler and long jumper's 4th place finish earned him All American status for the first time. In the final event of the three day meet, William Hall High School also took 4th place in the distance medley relay to bring home more All American athletes to the Nutmeg state. Juniors Miller Anderson, Muhammad Ali, Trey Cormier and senior Naji Middleton ran 10:07.40, which cracks the top 10 All Time in Connecticut history. Scroll though the following pages to see how all CT athletes finished on Sunday down in North Carolina.